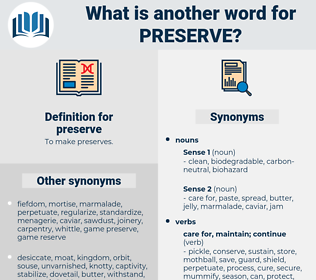 What is another word for preserve? uphold, upholding, perpetuate, salvage, guarantee, prevent, observe, nurture, persevere, enshrine, cherish, receive, respect, enforce, assert, shield, assure, rescue, consolidate, vindicate. 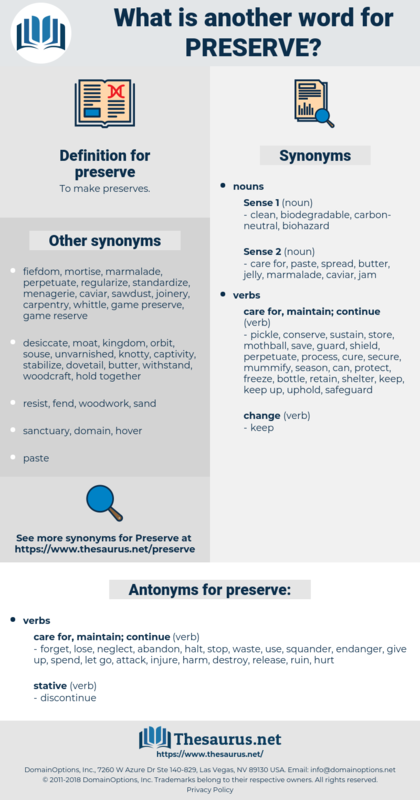 preserved, conserve, retain, conserving, maintain, conserved, sustain. preserved, conserve, retain, conserving, protect, conservation, maintain, sustain. prerogative, retain, conserving, conservation, maintain. conserve, retain, survive, guard, protect, safeguarding, maintain, sustain. forget, lose, neglect, abandon, halt, stop, waste, use, squander, endanger, give up, spend, let go, attack, injure, harm, destroy, release, ruin, hurt. break, impair, quit, wreck, damage, disregard, ignore. Those who were in the fortifications had quite as much on their hands as could be attended to just then, if they would preserve their lives, while those off duty were by no means inclined to come within the line of fire. corn, freeze-dry, tin, conserve, cure, put up, desiccate, refrigerate, salt, pickle, can, dehydrate. hang on, hold on, perpetuate, sustain, hang in, keep up, resume, re-start, mummify, persist, persevere, restart, prolong. domain, field, arena, sphere, area, orbit. cook, ready, fix, make, prepare.